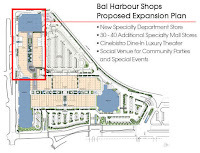 Loophole allowing some retailers to pay property tax as if vacant. The dark store tax argument. 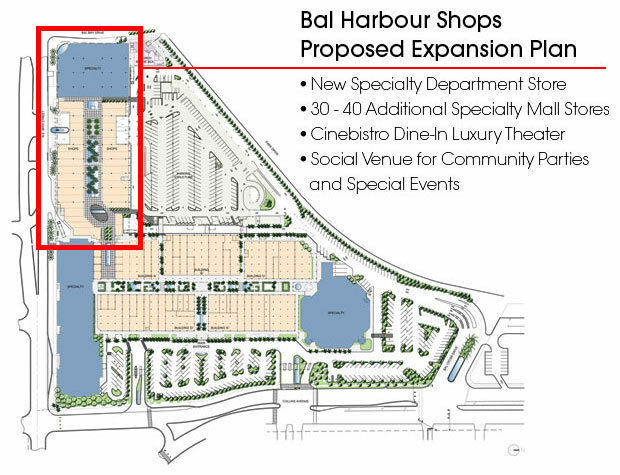 The underlying argument is millions of dollars have been spent to build a large box for a particular store. County property appraisers will then value the property based on the purchase price of the land plus the cost of construction, less depreciation. The property owner will then argue that the property should be valued based on comparable sales of similar properties, the way a house is valued for tax purposes. 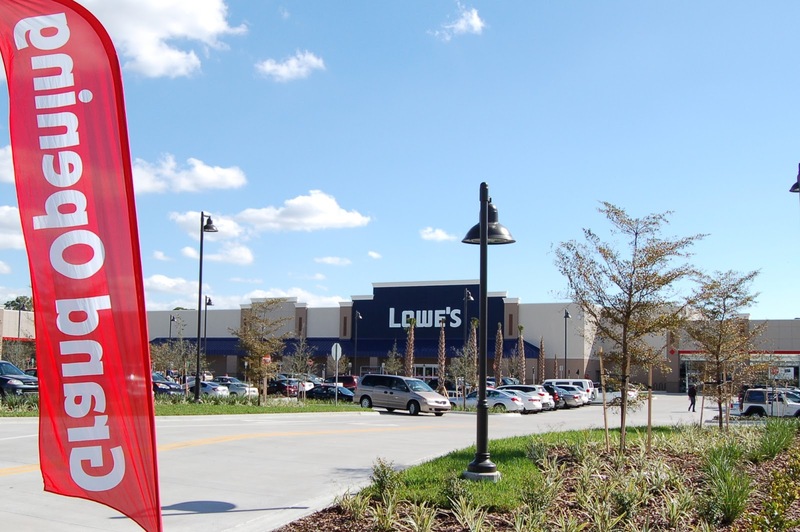 Over the past four years, many stores such as Lowe's and Target, have fought this fight. In most cases the stores have prevailed, saving millions of dollars in property taxes, according to the National Association of Counties. The store has a duty to their investors to watch their bottom line and pay their fair share. They are arguing that they are being over assessed and winning. 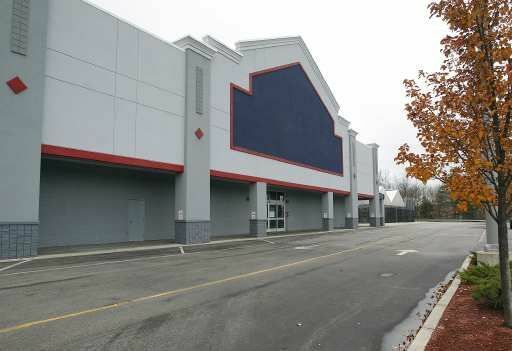 In Marquette, MI, the local Lowe's which built a store two years ago for $10 million argued that it really should be valued at $3.5 million. They argued that the resale value of other shuttered big-box stores throughout the state should determine the value, not the cost of construction. This resulted in a cut by two-thirds and Marquette had to return about $450,000 back to Lowe's. Their current tax bill was also lowered by more than $150,000 a year. Where lies the correct number? Construction, value-in-use, as vacant, or a blending of all of the above? While we at Property Tax Appeal Group have made this argument, it is difficult for the county to change how they value a particular type of construction or use after so many years of consistent valuations. Supreme Court will not hear the appeal from a married couple where each have a Homestead exemption in different states. TALLAHASSEE, Fla. – Dec. 9, 2016 – The Florida Supreme Court on Thursday declined to hear an appeal of a case that involved a married couple having homestead exemptions in two states. Justices, as is common, did not explain their reasons for turning down the appeal filed by Broward County resident Venice Endsley, who was married to her late husband, Robert, for more than 60 years. In the 1980s, Venice Endsley signed over her rights to a home in Huntington, Ind., to her husband. In turn, Robert Endsley signed over his rights to a home in Lauderdale-By-The-Sea to his wife. Venice Endsley had a homestead exemption on the Florida home, while her husband received a similar exemption on the Indiana home. The Broward County property appraiser learned of the arrangement in 2006 and said Venice Endsley was not entitled to a Florida homestead exemption, which resulted in a legal dispute as the court waded into questions about whether state law only barred multiple homestead exemptions in Florida or whether the prohibition also addresses properties in other states. In its ruling the 4th District Court of Appeal in March sided with the property appraiser, ruling that the Florida Constitution only allowed one homestead exemption to be claimed. A three-judge panel, pointing to a provision in the Florida Constitution, upheld a decision by a Broward County circuit judge, who found that the Endsleys were a "single family unit and could not claim separate homestead exemptions," according to the ruling in March 2016. "The trial court found that the plain language of the provision meant that only one homestead exemption was allowed, regardless of location. We agree," said the ruling, written by appeals-court Judge Alan Forst and joined by judges Melanie May and Rosemarie Scher. "The meaning of the Constitution's command that 'not more than one exemption shall be allowed any individual or family unit' appears clear on the face of the document." Attorneys for Venice Endsley then asked the Florida Supreme Court to take up the case. In turning down the request for an appeal, the Supreme Court effectively allows the ruling by the earlier Appeals Court to stand. Appraisal-free mortgages - they are coming. Freddie Mac is planning to dispense with traditional appraisals on some loan applications for home purchases. They are looking to replace the appraiser with an alternative valuation system that would be free of charge to both lenders and borrowers. Are you ready to put your trust in a computer? The mortgage provider is looking to begin offering the computerized appraisals as early as next spring. Freddie Mac claims that they plan to tap in to a vast trove of data it has assembled on millions of existing houses nationwide. The benefits of this would be a savings of about $350 to $600 and avoidance of time delays. While that sounds great for both the buyer and seller, is it? Yes you can acquire the home at a slightly lower cost but the risks involved could be great. Appraisers look at a variety of items in order to determine value. Would an automated appraisal catch things like roof leaks, illegal wiring, foundation issues, or missing structural walls. There are a variety of factors that a computer would not catch that a trained appraiser would. Is this a view into what the future will hold or a bad test. 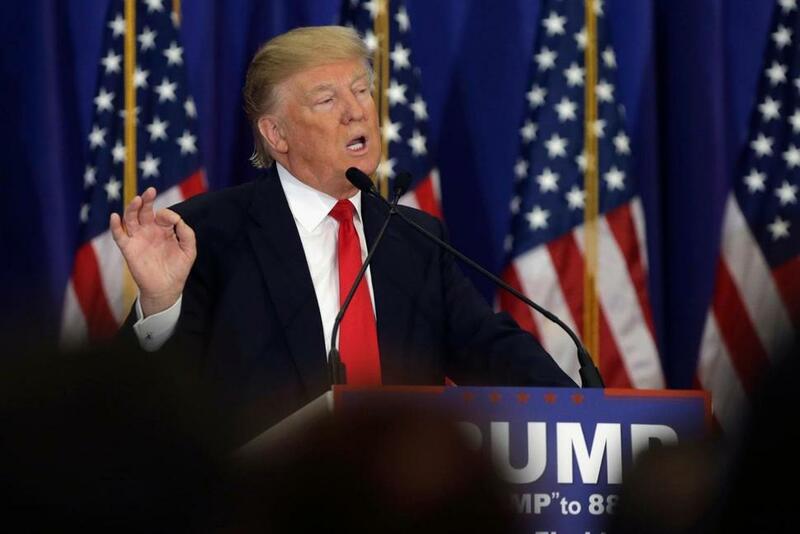 We will see but inevitably appraisers will still be needed. There are many transactions that are not typical and would call for a more through review. Another condo development is cutting back: Estates at Acqualina in Sunny Isles Beach. The luxury market is definately slowing down, the only question is will it remain a slow down or come to a halt? The Estates at Acqualina in Sunny Isles Beach has decided to cut back and focus on one tower vs. the two originally planned. “Sales have been slower than we anticipated over the last six months, particularly the fall-off in the Brazilian, Russian and Canadian markets,” he said. The developer has redesigned the project so that those who bought units in the delayed north tower will be accommodated in the still-ongoing south tower. Condos on the higher floors of the 51-story south tower have been enlarged with bigger balconies and additional rooms. The South tower, which is still being built, is schedualed for compleation in 2020. Asking prices start at $3.9 million. Developers have reacted to a drop-off in foreign buyers by pumping the brakes on condo projects across South Florida, including in Miami Beach, downtown Miami and the Upper East Side. The Hurricane just left, what do I do next? Having clear, actionable plans in place before a hurricane strikes can help your organization minimize damage to people and property and recover as quickly as possible. Stay safe and protect your property as much as you can. For Hurricane information visit the National Hurricane Center to stay up to date. Keep your business, your employees, and your families safe. Once the wind and rain have passed, you have checked on your loved one, then you look around. Please remember to document your damage. It may help with your property tax appeal and especially you potential insurance claim. Things you should take photos of if present include: flooding, broken windows, damaged items (especially if in water) for insurance, roof damage, exterior shots from front and back of the house. Please remember to document the damage as much as possible and most important, STAY SAFE. We have not had a significant storm in this area for over a decade. do not take this storm for granted. It is better to be over prepared. Along with the joy of making money with rental properties, regardless of inflation, tax laws permit a building to be considered a depreciating deductible expense on your federal income taxes. The more your property is worth, the higher your net worth and the more taxes will be charged. Fortunately, together with other real estate expenses, they are deductible. Then with a proper presentation before the Value Adjustment Board, the local taxing authority may even write you a tax refund check, once you explain that your property assessment is too high. Take advantage of what the law allows. Filing a property tax appeal is a right afforded to every taxpayer. The truth is, odds are in your favor in obtaining least a partial victory. This is truly a win-win situation. How to (not) pay taxes like a developer. Which we were referenced in. 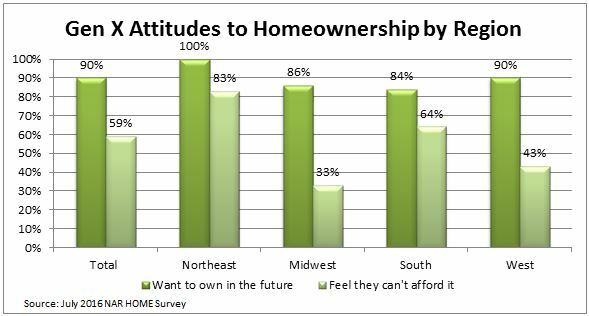 Many Realtors are focusing on the Millennials right now as history has told us that they are at the 1st home buying age. Problem is the trend has broken. Many are holding off on the purchase for a few reasons. The obvious is price, they can not afford it, mobility (many like being able to move around on short notice), recent history (they saw their parents lose their homes), and more. One group close in age is Gen-X. They were born between 1960 and 1980, they are 26 percent of recent buyers, in their peak income-making years, highest median priced home of all other buyers, and the largest homes in median square footage and number of bedrooms. While both Gen-X and Millennials both do want to own homes, the Gen-X group is currently at the age of significant life changes. The changes, marriage, children, job stability... are triggers for the purchase. This differs from previous generations where a home purchase was looked at as an investment that you wanted to buy as soon as you were able. I guess the U.S. could have used some GAP insurance for this slow down. The past simply followed the cycle. Times have changed, a new cycle has begun and it can not be relied upon. Yes, they are buying, but there is no sense of urgency. This post was created with information from the article written by Meredith Dunn, Research Communications Manager, NATIONAL ASSOCIATION OF REALTORS®. The original story may be found @ Power Broker Report. If you have not already signed up, please beware that this seminar has been SOLD OUT. Please contact us directly so we can assist you directly. For those of you that were able to register we look forward to seeing you there. Thank you to Gibraltar Bank for hosting the event. If you own property in Broward County, your TRIM notice is in the mail (August 13, 2016). Please DO NOT IGNORE it. The top of the TRIM notice will state this is not a bill, do not pay. The bottom with state if you do not agree with the proposed amounts, you MUST appeal now. If you wait for the final bill it will be to late. Please, if the amounts do not look right to you or your would like us to review and discuss with you what we see, please call. There will be no charge what so ever to discuss. We are happy to give you our opinion on your property and then you can decide for your self if you would like us to appeal for you. Broward County Appraisers office believes that as a whole, "properties in Broward increased countywide by 8.8% in taxable value this year on average countywide." (BCPA) Now, if you have a Homestead on your property, at first glance your "Market Value" will be higher than your assessed value. Yes that is good, but do not be blinded by that savings. Your property may still be appraised incorrectly and while "Market Value" has gone up, by the County appraising by a "Mass Appraisal" their may be factors that they do not know about that would cause your property to be to be valued 7% less than last year. 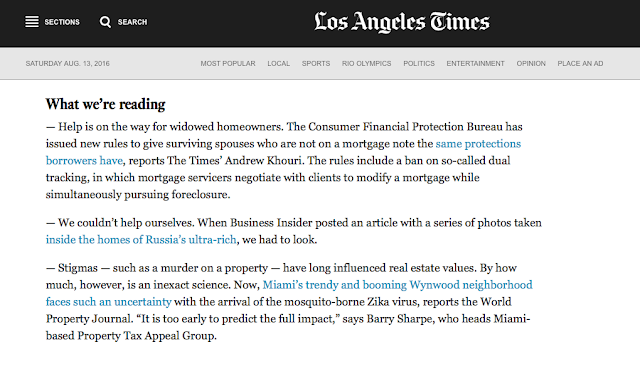 pTag just received a mention in the Real Estate section of the LA Times. 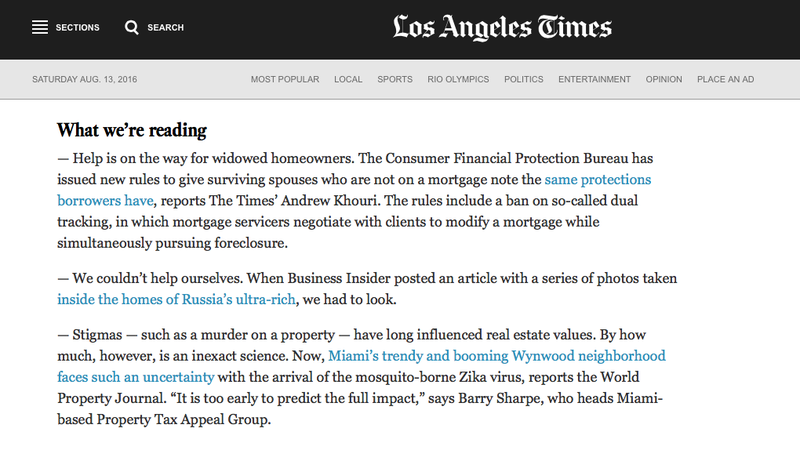 We were referenced regarding the Zika issue in Wynwood and the Stigma effect that could take place in the area. 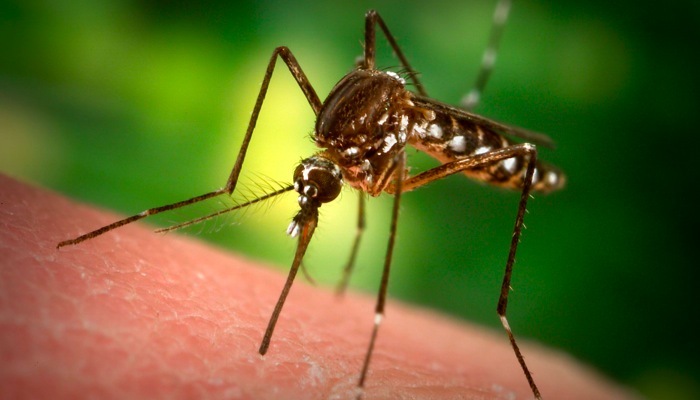 HousingWire reporter Kelsey Ramirez says that Miami's boom in property values in recent years may end if the world's fear of the Zika virus continues. The new virus which is spread by mosquitoes is deterring buyers from purchasing in the South Florida city and may cause housing values to plummet. Today at 8:30AM, Barry Sharpe was a guest on Radio Caracol. He was given the opportunity to share some knowledge about Property Tax appeals with the listeners. Ismael Trivino and Lina Tejeiro had an open conversation on the benefits of appealing your Property Taxes and how most people do not realize you can. As the station found Mr. Sharpe's ability to discuss the topic of Property Taxes with excitement and enthusiasm as well as imparting useful information he was invited back to speak again. While appearing on Radio Caracol previously, this was the first opportunity he had to discuss the topic with Lina & Ismael. We hope you were able to catch the show when it aired, but if you were not able to, please visit the stations site to listen in. Wynwood has seen property values sky-rocket within recent years. It has become the place to see and be seen. That is until now, recently Wynwood has become the Hot Zone in the US for the Zyka outbreak. Now when people are deciding which trendy restaurant to go out to, they fear Wynwood. If people do not go to restaurants or stores, there will be a drop in their revenues. This will result in a lower demand for rentals and purchases. We have already seen some outdoor restaurants close temporarily and tours have halted visiting the area. Tenants in that area will not be able to pay rent, building owners will have to give concessions hoping this stigma will go away and tenants will be able to thrive again. What if it does not go away? 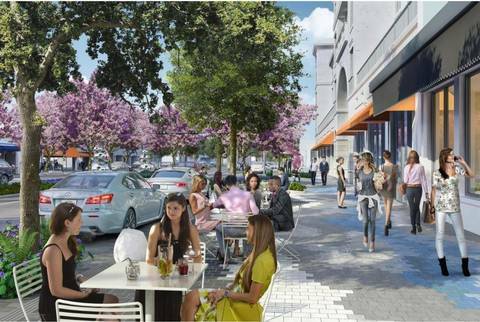 Will the popular Wynwood area die out just as it has become the place to be? If the risk of getting the Zika virus remains high for a longer period of time, businesses may be forced to close, which will depress overall real estate values. 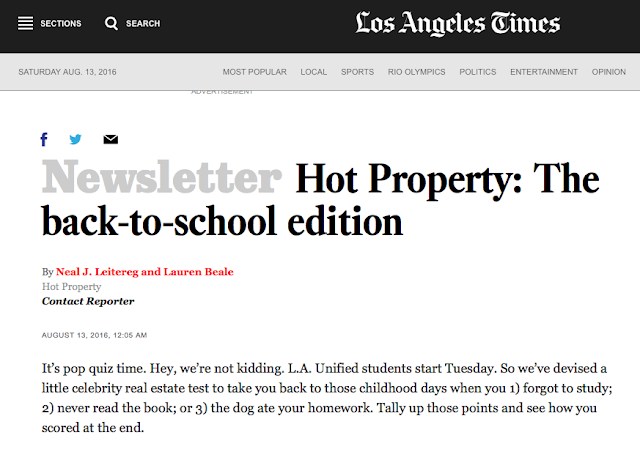 This is something that should be considered by the Miami-Dade County Property Tax Appraiser. When it comes to reducing property assessments in affected and surrounding areas. This is a situation that is sometimes overlooked in arriving at assessed values, especially when it will result in lower tax revenues. 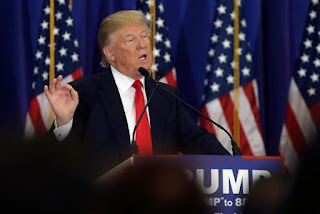 The National Taxpayers Union Foundation (NTUF), a non-partisan research and educational organization estimates that fewer than 5% of taxpayers challenge their assessments. Taxpayers should be made aware that Florida provides mechanisms to challenge assessment for situations such as this one. Barry Sharpe, who heads Miami-based Property Tax Appeal Group (P-TAG), says that most property owners don’t even think about appealing their property assessments. This is something they should all now consider doing. The County’s elected officials will also soon be facing a new problem. If they do not receive federal aid very soon. They may have to increase their property millage (tax) rate, to cover the costs of eradicating the mosquito problem. As this is all new to this area it is too early to predict the full impact this condition will create. Are you looking to buy a Condo in Florida, whether it is one story, four stories, or more, make sure they have fire sprinklers. If they do not, there is a good chance the association is about to spend thousands of dollars to have them installed. That means that association dues will be going up. The state agency regulating condominiums recently said that all condos, not just high rise buildings, must install fire sprinkler systems. The association could vote to opt-out but either way it will cost you. Florida statutes section 718 that addresses Condominiums, recently removed the requirement that applied to buildings taller than 75 feet, about seven stories. On average, it is being estimated that expenses between each unit would be about $2,000. Many of these low rise condos are owned by senior citizens that live on fixed incomes than are not prepared for the additional costs. Also, the inconvenience of construction and ne sprinkler heads and pipes that were not initially planned and in an attempt to hide could result in sections of lower ceiling height or simple aesthetically unappealing. Option one would be simply to do the retrofit and have the fire sprinklers installed. While it would involve inconvenience and expense, it would inevitably lower your insurance rates. Option two would be to waive out and not install. The issue here would be insurance. One can assume that rates would go higher regardless as the current law would call for the fire sprinkler protection. Your association would simply be choosing not to comply (legal but not a good idea). In addition, there could be carriers that do not want to insure condos that do not meet the new requirements. We will not know how this will be enforced until 2017. Should an association not comply and not vote it out, they would most likely receive fines and violations until they comply. This could also be a a trigger for insurance companies to cancel a policy. Should you currently live in a a condo, make sure your association does not ignore this change. If you are looking to buy a condo, do your homework and find out what you will be responsible for. Think you have reasons for a property tax reduction or your building is improperly assessed, we would be happy to help. Just contact us at the Property Tax Appeal Group. Property owners need to carefully read the County's TRIM notice which arrives before the tax bill, and make sure they timely appeal their Property Taxes with their County Tax Collector. "DO NOT PAY THIS IS NOT A BILL" THE FACT THAT IF YOU DO NOT APPEAL NOW, YOU FOREFIT YOUR RIGHT TO APPEAL THE BILL. While the bold letters at the top of the page with state "DO NOT PAY THIS IS NOT A BILL," if you wait for the bill to arrive, you will have missed your window. The TRIM notice is to inform you of the potential rates, it is up to you to request the appeal if you disagree with the amounts before you receive the bill. Make sure to pay your property taxes before the deadline date, typically the end of March. Regardless of whether you are in the process of appealing your property taxes, your failure to timely pay before the end of March will require the County to automatically deny your property tax petition, and the County will also charge interest on the late payment. The Miami Herald and The Real Deal recently published stories examining the Property Tax refund that the Genting group is receiving. Barry Sharpe, of our PTAG (Property Tax Appeal Group) was interviewed by the Herald for the story. The Malaysian gaming giant has reportedly saved millions on property taxes at its bayfront development site by appealing its assessed value multiple times, spurring lawsuits between both Genting and the county. In 2011, Genting paid $236 million to buy the iconic Miami Herald building and several other properties along Biscayne Boulevard for a total of 14 acres. 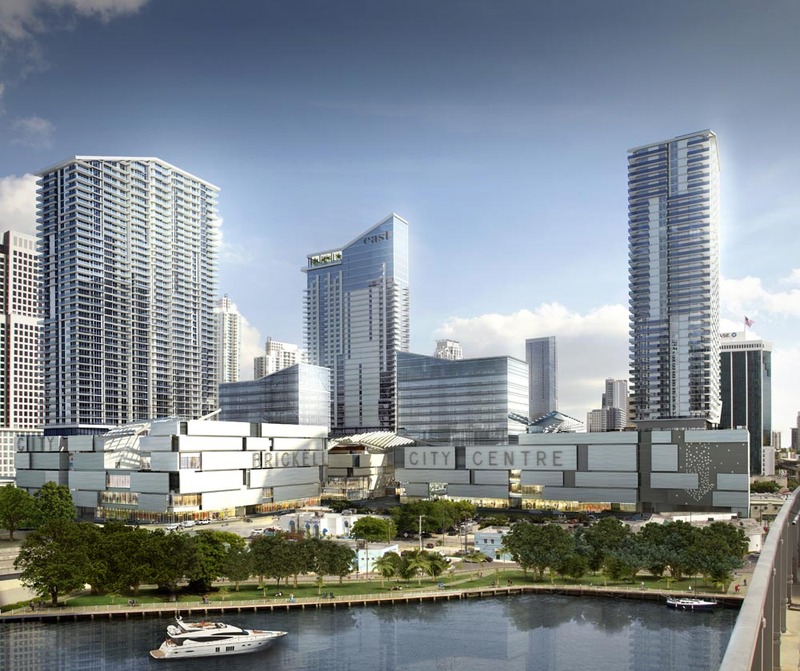 The company planned to erect a massive gaming and leisure complex dubbed Resorts World Miami, though the site has stagnated since Genting finished demolishing the former Herald building last year. In 2012, the board cut Genting’s assessed property values to $88 million — a dramatic decrease from the property appraiser’s assessment of $132 million, according to the Herald. In 2013, the board reduced the property appraiser’s assessment by 25 percent, and then again in 2014 by 20 percent, according to county records cited by the Herald. As a result of those value cuts, Miami-Dade has to refund more than $2.3 million to Genting from property taxes the company already paid before the appeals went through — plus 12 percent interest. 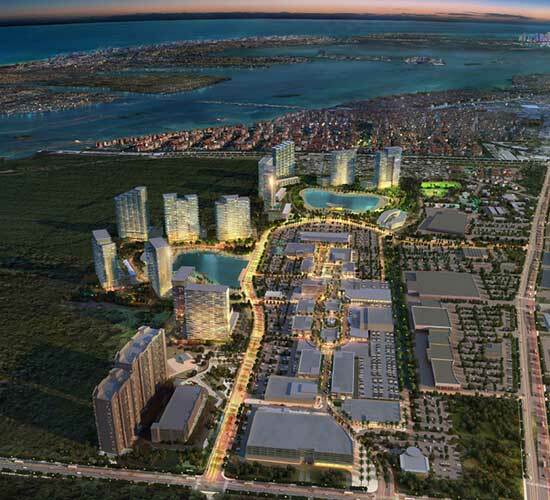 That has required Miami-Dade tax authorities to issue Genting’s Resorts World Miami subsidiary $2,322,434 in refunds, with $68,984 more pending, according to figures compiled by the county tax collector’s office. Barry Sharpe of the Property Tax Appeal Group, said reductions of the proportion Genting won are not unprecedented but are certainly uncommon. Most clients, Sharpe said, are happy to win a reduction of 10 percent or less, though he said he has on occasion won cuts twice that large. He said determining the assessed value of a property is a subjective exercise, and that skilled attorneys can make a case for a large reduction based not only on comparable sales but other factors that could limit a property’s resale price. Those could include zoning, proximity to busy roads, the view, or the condition of buildings or the land. 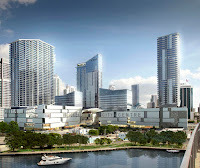 Though prices of waterfront land in and around downtown Miami have been soaring, Sharpe said, factors particular to that property could limit how much volume Genting could build on the land or what obstacles the property presents to construction —and thus limit the value of the land. “The more you can build, the more valuable the land typically is,” Sharpe said. Due to the improper assessments, the county must also pay $255,344 with accounts for the 12% interest on the tax fees that were refunded. Millennials are beginning to accept the suburbs. In the past, the younger generation was looking to more to a more metropolitan area and avoiding a commute. While still popular, the millennial generation has broken that trend and are now moving into the suburbs. The share of millennials buying in an urban or central city area decreased to 17 percent (21 percent a year ago) in this year's survey, and fewer (10 percent) purchased a multifamily home compared to a year ago (15 percent). Overall, the majority of buyers in all generations prefers a single-family home in a suburban area – and the younger the buyer, the older the home they purchased. "The median age of a millennial home buyer is 30 years old, which typically is the time in life where one settles down to marry and raise a family," says Lawrence Yun, NAR chief economist. "Even if an urban setting is where (millennials) like to buy their first home, the need for more space at an affordable price is, for the most part, pushing their search farther out. "Furthermore, limited inventory in millennials' price range, minimal entry-level condo construction and affordability pressures make buying in the city extremely difficult for most young households," Yun adds. In order to pay for the home , the median down payment ranged from 7 percent for millennial buyers to 21 percent for older boomers and the Silent Generation. Nearly a quarter (23 percent) of millennials cited a gift from a relative or friend – typically their parents – as a source of their down payment. Millennial home buyers median income this year was $77,400 ($76,900 in 2014), and they typically bought a 1,720-square foot home costing $187,400 ($180,900 a year ago). The typical Gen X buyer was 42 years old, had a median income of $104,700 ($104,600 a year ago) and typically purchased the largest home compared to other generations (2,200-square feet), at a cost of $263,200 ($250,000 last year). Generation X buyers (71 percent) were the most likely to be married, younger boomers had the highest share of single female buyers (20 percent), and 12 percent of millennial buyers were unmarried couples. The millennial generation's primary reason to buy? 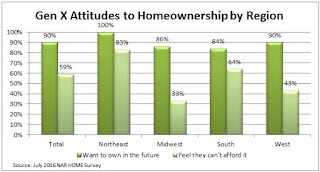 They want a home of their own, according to 48 percent (39 percent a year ago). The desire for a larger home was highest among Gen X buyers (16 percent), and older boomers (20 percent) were most likely to buy because of retirement. Gen X buyers represented the largest share of single-family home buyers at 89 percent (85 percent a year ago), and younger boomers were most likely to purchase a townhouse or row house (9 percent). A combined 3 percent of millennial buyers bought an apartment, condo or duplex in a building with two or more units (7 percent a year ago). Please read the full article to all information.